Durable (Financial) Power of Attorney – Used to enable the Principal to elect a financial representative. Begin with the first empty line of this document. Print the Full Name of the Declarant who intends to deliver some or all the Principal Authority he or she has when making Health Care Decisions to a Health Care Agent. The individual who will act on behalf of the Declarant regarding his or her Health Care Decision must have his or her Full Name printed on the line labeled “Name Of Primary Agent.” Make sure to enter his or her E-Mail Address in the area labeled “E-Mail.” Furnish the Home Address of the Primary Agent on the “Home Address” line. This line will also have a second area where you should report the Primary Agent’s current “Telephone Number.” The Principal can also name a Successor Agent who will automatically gain the Principal Powers here if or when the Primary Agent is unable/unavailable to represent the Principal’s wishes. If the Principal would like to name such an entity through such a document then fill in the Successor Agent’s Full Name, E-Mail Address, Home Address, and Telephone Number on the next two blank lines. Ultimately, the Declarant will have complete control over the Principal Health Care Powers that will be designated to the Primary Agent. All the Principal Powers the Primary Agent may wield on behalf of the Declarant must be clearly reported in this paperwork before the Principal signs it. Any Principal Decisions or Actions the Declarant does not want the Primary Agent engaging in on his or her behalf should not appear in this document. It will be up to the Declarant to read the list of Principal Powers this document (by default) has been constructed in “B. Powers Of My Agent.” The Principal should set aside enough time to personally review this list of Principal Decisions and Actions the Primary Agent may perform in his or her Name. If there are any Principal Powers in this list that should be restricted from the Primary Agent’s power to represent the Principal, then it should be struck through or deleted altogether from this list. The first item on this list will describe how the Primary Agent may “Consent To Or Refuse Or Withdraw Consent To Any Type Of Health Care” on behalf of the Declarant. This includes a wide range of decisions or actions the Primary Agent may engage in. For instance, he or she can decide upon whether Artificial Nutrition or Respiration should be administered or denied to the Declarant using the voice the Declarant. If the Principal Declarant is comfortable with the appointment of this type of Power, this statement should remain unaltered. If the Declarant wants to remove this statement or parts of it, then strike through the unwanted parts with a horizontal line or simply delete these areas. The Declarant may also choose to include provisions regarding these Powers in the next section. The second item on this list shall give the Primary Agent the right to “Request, Receive And Review Any Oral Or Written Information Regarding” the Declarant’s Health (Physical and Mental). This statement may be removed if the Declarant does not want the Primary Agent to have access to his or her Medical Records by crossing it out or deleting it. If the Declarant only wants to adjust this access he or she may address this later in the document. The third item on this list will give the Primary Agent the Principal Power of deciding which of the Declarant’s Health Care Providers should be Employed or Discharged in relation to the Declarant’s Medical Treatment/Therapy Item #4 appoints the Primary Agent with the Declarant’s Principal Power to authorize the Declarant “Admission, Transfer, Or Discharge” from Health Care or Medical Facilities. 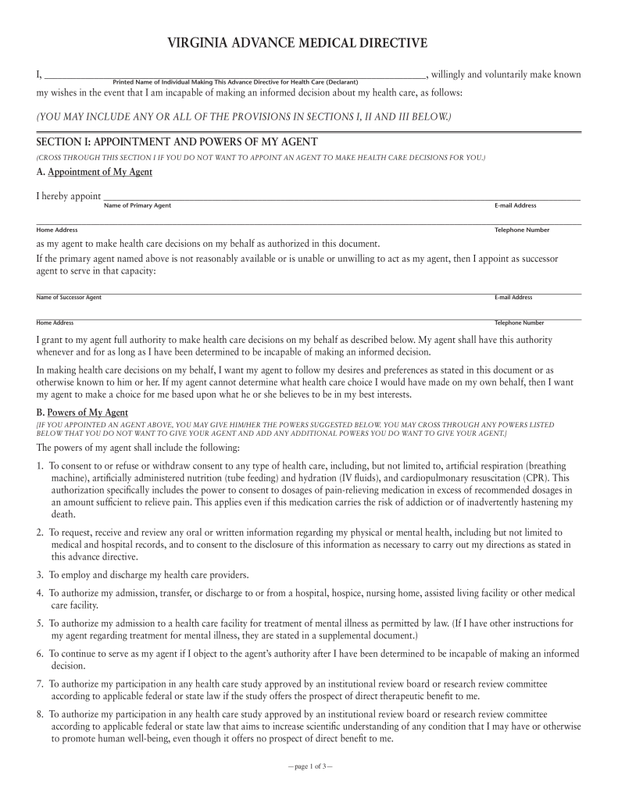 The fifth list item will specifically give the Primary Agent the Principal Power to handle the Declarant’s admission to Health Care Facilities for the “Treatment Of Mental Illness As Permitted By Law” If the Declarant wishes that the Primary Agent retain these Principal Powers in a scenario where the Declarant has been diagnosed as being “Incapable Of Making An Informed Decision” and objects to the Primary Agent’s Authority, the sixth item on this list should be left unaltered. The Principal can have this item deleted or crossed out at any time before the Signature Date on this paperwork to exclude it from this appointment’s terms. The Declarant can decide to grant the Primary Agent the Principal Power to Authorize the Declarant’s “Participation In Any Health Care Study Approved By An Institutional Review Board Or Research Review Committee,” if the study will benefit the Principal in a therapeutic manner as per the seventh item. If the Declarant intends to restrict the Primary Agent from being able to behave with Principal Authority in this manner, then this statement should be removed, crossed out, or otherwise deleted. 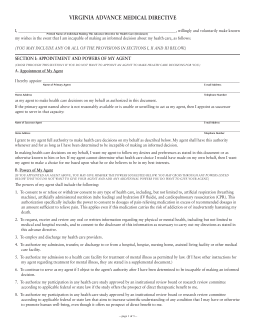 The eighth list item will state the Declarant’s approval of the Primary Agent’s ability to Authorized his or her participation in an approved Health Care Study so long as it increases the “Scientific Understanding Of Any Condition” the Declarant has or generally promotes the “Human Well-Being.” This statement should remain if the Declarant believes his or her Primary Agent should have this Authority or deleted if the Declarant wishes to restrict these Powers from the Primary Agent. The Declarant can give the Primary Agent the right to “Make Decision Regarding Visitation During Any Time” the Declarant is admitted in a Health Care Facility. A blank line has been provided in this item (number nine) so any additional instructions regarding this matter may be documented. If the Declarant does not wish to grant this Principal Authority to the Primary Agent, then cross out or delete statement number nine. The tenth item on this list grants the Primary Agent the Principal Authority to “Take Any Lawful Actions” necessary to carry out the Declarant’s Directives as they are set in this paperwork. If the Declarant wishes to restrict the Primary Agent from using his or her Principal Authority in this manner, then this item should be struck through or deleted. The Declarant may also have additional instructions or provisions that should be taken into account and/or applied to these Principal Powers. He or she may have certain scenarios in mind, religious or spiritual concerns, impose some limitations, or grant additional liberties in the use of the Powers granted to the Agent. These provisions should be listed in the area titled “Additional Powers Or Limitations, If Any.” Several blank lines have been supplied for this purpose, however, if more room is required you may continue on an attachment. The Declarant may choose to continue to the next section to provide additional directives that should be applied when his or her death is imminent or conclude this document in the next section. Generally, it is recommended to be as inclusive as possible. The first item in “Section II: My Health Care Instructions” will require a mark or check in one of the three checkboxes. If the Declarant does not want his or her life prolonged with machines or treatments (when death is unavoidable) then the first box should be marked. If the Declarant wishes to receive all life-prolonging treatments (within the law and Health Care Standards) even when death is imminent then the second box should be marked. If the Principal has more specific instructions regarding this scenario, then mark the third checkbox and supply these instructions on the blank lines provided below this choice. The second item will deal with the scenario of the Declarant losing his or her awareness of the people around him or her and the environment he or she is in with no reasonable chance of recovery. If the Declarant does not want any life-prolonging procedures administered, then mark the first box in the second item. If the Declarant does want life-prolonging treatment administered when necessary, then mark the second box. If the Declarant The Declarant can also set a period of time when he or she will accept treatments and life-prolonging procedures in the hopes that his or her condition will improve. If at the end of this period no results or improvement can be seen, all such procedures and treatment should be withheld. If this is the Principal’s preference, then mark the third checkbox and enter this period on the blank line supplied in this choice If the Declarant has specific instructions regarding the scenario where a medical event has compromised his or her faculties and awareness, then the fourth checkbox should be marked. These instructions may be supplied on the blank lines provided here. The third item in this section will allow for additional and specific instructions from the Declarant that include limitations, restrictions, concerns, etc. to be documented. If there are any such instructions, then mark document them on the blank spaces provided here. “Section III: Anatomical Gifts” will supply three choices to define how the Declarant feels about this subject. If he or she intends to donate “…Organs, Eyes, And Tissues For Use In Transplantation, Therapy, Research And Education” and that every effort is made to sustain the suitability of these body parts, then mark the first checkbox. If the Declarant intends to donate his or her “Whole Body For Research And Education” then, mark the second checkbox. If the Declarant has instructions regarding Anatomical Gifts, they should be recorded on the blank lines supplied in this section. The section titled “Affirmation And Right To Revoke” will conclude this directive with the Declarant’s Witnessed and Dated Signature. He or she should take a moment to review this document. If it represents the Declarant’s wishes, then it may be executed at his or her discretion. To do so, the Declarant should enter the Current Calendar Date on the line labeled “Date” in this section. After supplying the Signature Date, the Declarant should sign the “Signature Of Declarant” line then, surrender this document to the two individuals serving as this signing’s Witnesses. Each Witness must sign the “Witness Signature” line then print his or her Name on the “Witness Printed” line.